The Naugatcuk River follows Route 8 for most of its course, emptying into the Housatonic River near the Derby Dam. A large river with a relatively steep gradient in its upper stretches, the Naugatuck River has strong flows and deep pools which make it ideal habitat for trout and an excellent river to accomodate the state's annual stocking of broodstock Atlantic Salmon. Unfortunately, much of the mid-to-lower portion of the Naugatuck River suffered through decades of industrial use, with chemicals and other industrial pollution damaging the water quality and severely impacting the river's wildlife. Over the past several years, insect hatches have begun to re-emerge on the Naugatuck River in large enough numbers to sustain trout populations. Each fall, from mid-October through November, the state stocks anywhere from 800 to 1,600 broodstock Atlantic Salmon into two rivers (the Naugatuck River and the Shetucket River) and several lakes in Connecticut. These salmon, used for breeding purposes as part of the Atlantic Salmon reintroduction program, can be monsters up to 30 pounds. Most range in size from five to ten pounds. 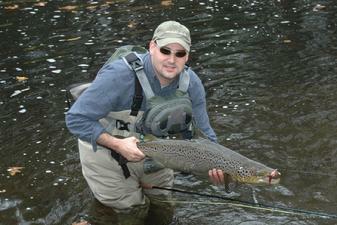 When fly fishing for Atlantic Salmon, anglers have two area on the Naugatuck River to focus on. The lower section runs from Prospect Street in Naugatuck downstream to Pines Bridge Road in Beacon Falls - Exits 23 through 26 on Route 8. 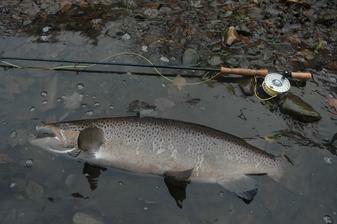 Here the river is wide, deep and fast flowing and can be a challenge to fish and to wade. The Atlantic Salmon used to be stocked throughout this stretch, including through the Naugatuck State Forest, but restrictions preventing the state and volunteers from crossing the railroad tracks means the salmon are now stocked in a smaller number of pools, typically closer to bridges, parking lots and other access areas. 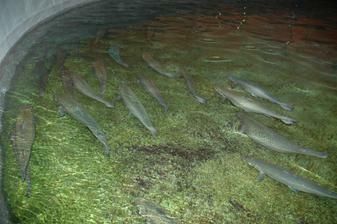 The salmon will move up and downstream after being stocked, but many tend to hold in the pool in which they were stocked. Fly fishermen unfamiliar with the river should focus their efforts in a handful of locations and walk other sections of river to discover pools near the stocking areas. 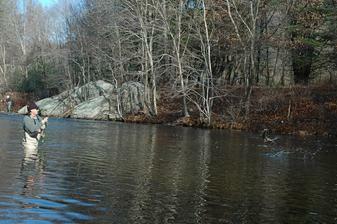 The bridge pool at Pines Bridge Road in Beacon Falls is an excellent place to start, but also receives a significant amount of fishing pressure. Another popular spot is Breen Field off Exit 26 in Naugatuck. The upper section of the river stocked with Atlantic Salmon runs from Route 118 in Litchfield-Harwinton downstream to the Thomaston Dam - Exits 40 to 41 on Route 8. 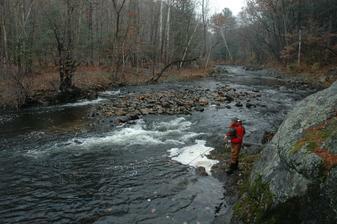 Exit 41, Campville, is the most popular place to fish as the river winds its way through heavily wooded portions of the Mattatuck State Forest and other public lands. The river here is smaller - typically 20-40 feet wide - but much deeper with several large plunge pools and waterfalls below which the Atlantic Salmon tend to hold up. Because of the smaller nature of the river, the Atlantic Salmon stocked in this section tend to become line shy quite quickly and can be more difficult to catch. The Atlantic Salmon season runs from October 1 through November 30 as a catch-and-release fishery, where all salmon must be returned to the river. 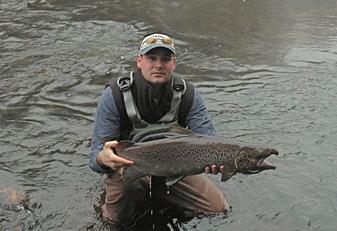 From December 1 through March 31 anglers may keep one salmon per day. From April 1 through Opening Day (the third Saturday in April) while the state is stocking trout into the rivers, anglers can not fish for species other than Atlantic Salmon - except in the upper stretch of the Naugatuck, which also serves as a catch-and-release Trout Management Area. When fly fishing for Atlantic Salmon in the Naugatuck River, anglers are prohibited from using more than one fly or artificial lure, which must have only a single hook. No split shot or other weight may be added to the line. Atlantic Salmon are extremely powerful fighting fish - particularly those over 20 pounds - and fly fishermen should use heavier tackle when fishing for Atlantic Salmon in the Naugatuck River. For rods, a 7-weight to 9-weight rod is appropriate with a mid- or large-arbor fly reel that has a strong drag system and plenty of backing. A sink-tip fly fishing line works best for Atlantic Salmon, as it will get your fly down, but will not catch on rock and tree limbs like a full sinking line. For leaders, a 6 to 7.5 foot leader is best in five to ten pound test. If the salmon appear to be line shy on a particular day, a longer, lighter leader may be needed. Fly selections for broodstock Atlantic Salmon can range from the garish - big, bright bunny leech patterns - to the more obscure nymph and streamer patterns commonly used for trout. Bright flies in whites, pinks, yellows and reds work best at eliciting slashing strikes from aggressive Atlantic Salmon, but small bead head nymphs on lighter leaders can also be effective when the salmon have been put down by fishing pressure. Mornings on the Naugatuck River in late fall can be quite cold - sometimes in the low teens - so anglers should dress accordingly and in layers to stay warm. Fleece wading pants are a must, and fingerless, rag wool gloves are suggested to keep hands warm in the brisk air and when handling fish in the water.